Rest, which by nature triathletes are inherently bad at, is an integral part of the healing process. This is when the body heals itself and gets stronger, whether you are taking a day or a few weeks off from working out or reducing the intensity or volume of your workouts. Prevention techniques that assist with healing, including stretching and specific strengthening, are often overlooked but are an essential part of triathlon training. Injuries are not an act of nature. They indicate that the athlete has reached a breakdown point at which the body can no longer respond in a positive fashion and heal the injury. The body is pushed past its reparative capabilities and begins to develop signs and symptoms of injury. One of the hallmark symptoms of injury is pain. We all have experienced discomfort when working out, but when is it bad to push through the discomfort? Pain can be defined as an unpleasant sensation that is often associated with damage to the body. What about the sayings “Pain is just weakness leaving the body” and “No pain, no gain”? These proverbs are fun to say but if practiced can lead you down the path of chronic injury. Any discomfort may be an early warning sign of injury. Discomfort that begins with an activity but goes away as you warm up may be an acceptable symptom you are able to train through with appropriate modifications. However, discomfort that continues through the activity should be a clear warning sign that something is not right, and activity should be discontinued. Discomfort that persists after the activity, does not respond to the basic treatment of RICE (rest, ice, compression, elevation), and affects other functions including activities of daily living should be treated and, if necessary, evaluated by a sports medicine specialist. The ability to recognize when something is wrong is the first step to treating the injury. Maturity and experience help this process. A qualified coach or trainer can help you develop appropriate workouts; a well-designed training plan can minimize the chance for injury. Keeping a training log is also important so you can look back and see if a specific workout or series of workouts was the precipitating agent of injury. Overuse injuries are particularly difficult to recognize. Often there is no one single event that causes the injury. Over a period of time the discomfort gradually becomes debilitating. Many of these injuries lack some of the signs of acute injury including bleeding, swelling, and tenderness. They just cause discomfort and pain when you want to swim, bike, and run. Treatment of injuries relies on a simple principle: Treat the cause as well as the effect. Mistakes in training plans can be corrected. 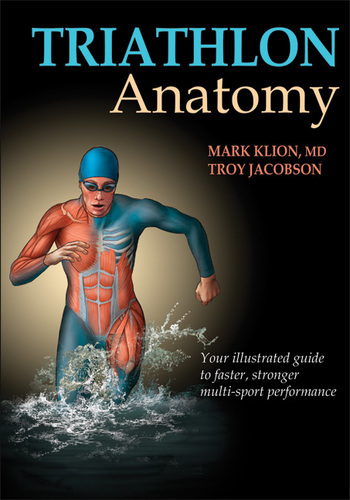 Equipment or technique issues such as poor swim stroke mechanics, improper bike fit, and worn-out sneakers should be considered. Nutrition issues also play a role in injury prevention and treatment. Diets deficient in protein and adequate carbohydrate fail to address the nutrition demands placed on the body during strenuous exercise. This is demonstrated in the female athlete triad, in which eating disorders, lower than optimal body weight, and abnormal menstruation due to loss of proper hormonal control lead to the development of stress-related injuries to bone, including stress fractures. The RICE approach, which stands for rest, ice, compression, and elevation, applies to the basic treatment of any injury. If rest is a bad word to you, try relative rest, during which you perform alternative activities (cross-train) that cause no discomfort. Use ice on an acute injury of any type for the first 36 to 48 hours. After that it can be very useful for pain control. Apply ice to the affected area for 10 to 15 minutes every 2 to 3 hours. Protect the skin with a piece of light fabric to prevent complications associated with ice, including skin burn. You may apply heat after the first 48 hours when stiffness may be present. Application principles are similar. No scientific literature supports alternating the two treatments; therefore it is not recommended. Compression is helpful to control swelling. In an acute situation, compression helps control bleeding and thus swelling. Wrapping the affected area comfortably with an elastic bandage can be effective for as long as tolerated. Elevation is helpful for extremity injuries as it also helps control swelling. Be sure to place the affected area above the level of the heart to allow the swelling to drain. Injury prevention requires a well-designed training plan with periods of rest and nutrition guidance for preworkout, in-workout, and postworkout consumption. Another important piece of the puzzle is a stretching program. Exercise places a great deal of stress on the tissues, which can lead to stiffness. This may lead to loss of motion about the joint and cause a change in biomechanics, which can lead to injury. Stretching needs to be part of any successful exercise program. Stretches can be performed both before and after workouts. A short warm-up of 5 to 10 minutes of light aerobic exercise may prevent injury when stretching before a workout. Muscles are probably more receptive to stretching after a workout. Amazingly, there is a lack of scientific evidence as to the duration of stretching or to its exact benefits; however, experts and athletes alike believe that if it feels good, it is probably doing some good. Dynamic stretching is a popular form of stretching among athletes and is recommended before engaging in training activities. Contrary to static stretching (stretch and hold), which is best performed after activities or as part of a cool-down, dynamic stretching includes a gentle and progressive active movement pattern throughout a comfortable range of motion, not exceeding that of a static stretch. Going beyond that range would be considered a ballistic stretch, which is not recommended. Dynamic stretching offers numerous benefits including increasing range of motion, increasing temperature, improving blood and oxygen flow to areas specific to the training activity, enhancing the nervous system and motor ability in preparation for training, and preventing training-related injuries. Performing a dynamic stretch is simple but requires caution. Begin with a short range of motion. As you warm up, increase the range of motion toward your maximum level. The walking lunge and carioca are two examples of dynamic stretches popular among triathletes and runners. For the walking lunge, stand with feet shoulder-width apart, and step forward with the leading foot to assume a lunge position. Supporting your body weight on your leading foot, stand erect again and step forward with the opposite foot. Repeat this series of walking lunges for 10 steps with each leg and repeat. The carioca is a good dynamic stretch that targets the hips and other areas of lateral movement. Stand with feet shoulder-width apart and knees slightly bent. Cross the left foot over and in front of the right foot. Repeat with the right foot crossing the left foot in a lateral movement, gently twisting at the hips. Travel for 30 to 50 feet (10 to 15 m) in one direction and then the other. Incorporating dynamic stretching as part of your training preparation will pay off in reducing risk of injury and enhancing your training performance.